StarCraft is a well-known sci-fi strategy video game from Blizzard Entertainment, and has been popular since the ‘90s. However, when your Mac notifies you that your storage is almost full, you have to sacrifice some data to optimize your Mac’s performance. Since the StarCraft Mac app takes 8 GB on your Hard Drive, it may need to be deleted at some point. 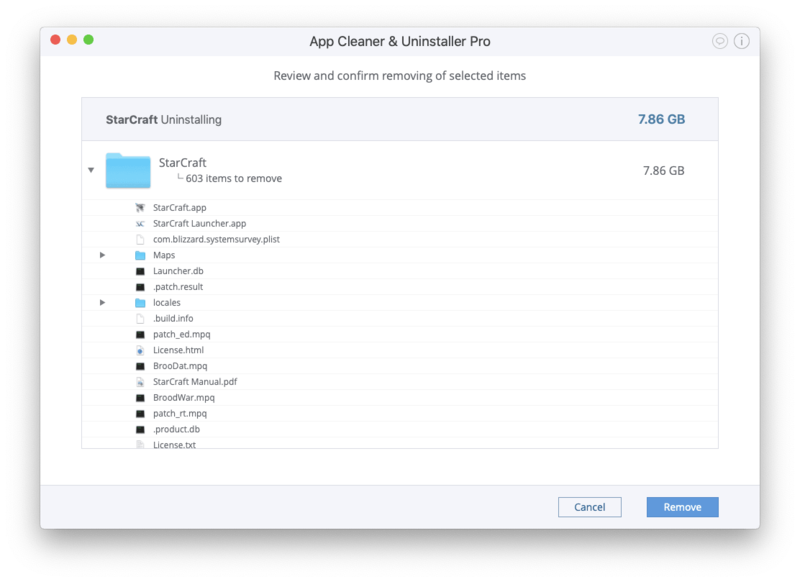 In this post, we will highlight three ways to uninstall StarCraft on a Mac completely and safely. Battle.net is an application for Mac, which allows you to download and play Blizzard games in one place. You can manage StarCraft settings or even uninstall the game within Battle.net. For this, open the Battle.net application → select StarCraft from the list of Games → click on Options → select Uninstall Game. If for any reason you cannot use this option or you cannot launch Battle.net, try the next two methods to uninstall the game. Escape StarCraft and quit the Battle.net app. To ensure that all processes of the game and app are stopped, launch the Activity Monitor application. You can find it in Finder → Applications → Utilities or use the Spotlight search. In the Activity Monitor’s window, check to see if StarCraft or Battle.net are in the list of launched applications. If so, select them and click on the X button in the top left corner to stop them. Confirm the action by clicking on the Quit button. Open the Applications folder. Find StarCraft folder → select StarCraft.app and drag it to the Trash. 4. Empty the Trash to completely get rid of the StarCraft application and its service files. Please note that it is quite likely you may find more files of StarCraft in other folders on your Mac. Therefore, we recommend that you use Funter, a free program that automatically finds all related files, including hidden ones, on your computer. Just launch Funter, type the name of the search item and hit Enter. You will get a list of all the files associated with the mentioned search word. Choose StarCraft from the list of Applications and all its service files will be selected automatically. 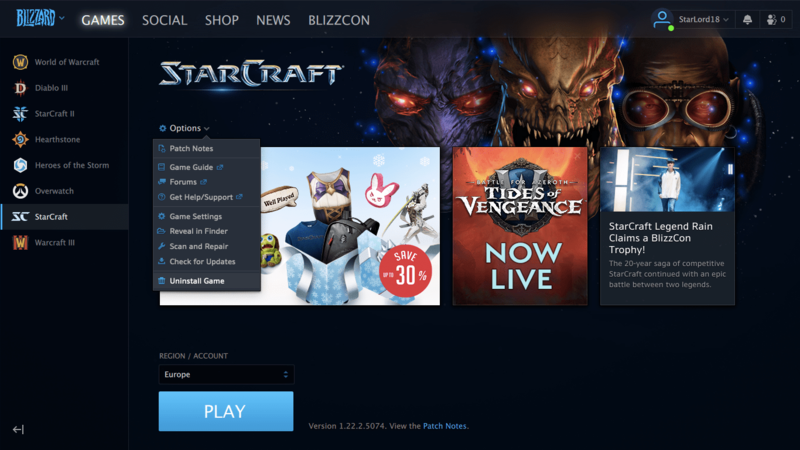 Click on the Uninstall button next to StarCraft. Review the files you want to get rid of and click on the Remove button. Complete the uninstalling of StarCraft by emptying the Trash bin. When you intend to uninstall a certain application, you should get rid of all the files it created on your disk. So, if an app has no uninstallation option or native uninstaller, you can delete it manually. But, you should also search your disk to find out exactly where the service files of the particular app are stored and remove them. However, you can also use App Cleaner & Uninstaller, which does this work automatically, removing applications and all their service files in less than a minute. 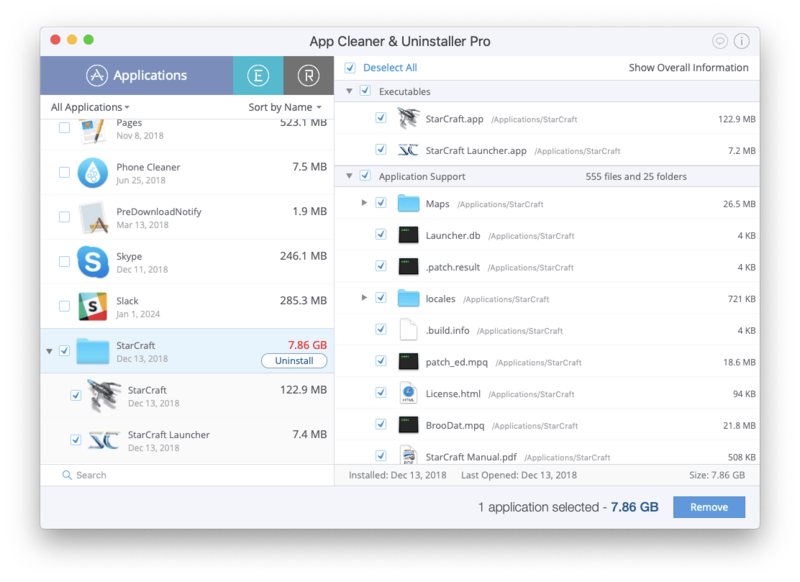 App Cleaner & Uninstaller removes apps entirely and safely. Learn more about this helpful software too to easily delete useless applications from your Mac.